The ESNM invites you to attend the General Assembly which will be held on occasion of UEG Week Vienna on Monday, October 20, 2014, 13:00-14:00, Meeting Room 2, ACV Vienna. 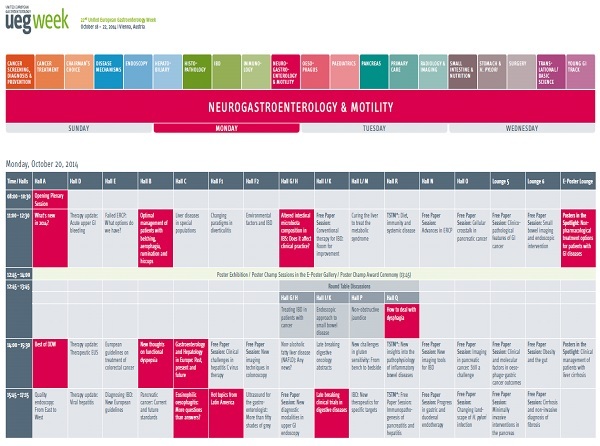 Find the speciality track for ESNM Members in the UEG Week Pathway Tool. The Altered intestinal microbiota composition in IBS session is part of the “Neurogastroenterology & Motility” speciality track. Check out the UEG Week Pathways Tool that helps you find sessions that are most relevant and interesting for your speciality! UEG Week Vienna 2014 - Come and stop by the ESNM Booth! Vienna, Austria. We look forward to meeting you at our booth in the UEG Association Village. Visit the congress webseite for further information !